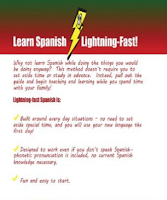 I recently had the opportunity to review Lightning-fast Spanish for Kids and Families: Learn Spanish, Speak Spanish, Teach Kids Spanish by author Carolyn Woods. This is a very different way to learn languages than traditional textbooks. It's based around situations that actually happen on a regular basis - meals, getting ready, directions, etc. It's also unique in that it doesn't require any language knowledge yourself. With clear pronunciation guides, parent and child can learn together. , and the vocabulary is limited to the situations included. However, that's actually nice because it's Spanish that can be used right off the bat. It won't get anyone to fluency, but it will act as a good introduction and a stepping stone into more rigorous studies of a language. It can also be used by parents at home to supplement their child's language learning at school, even if the parent has little or no knowledge. A copy of the Lightning-fast Language Sampler is available for free on the author's website. 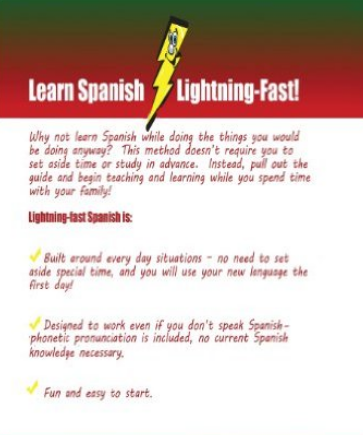 It includes 2 lessons and an activity for each of the 6 languages in the Lightning-fast Language series. They're also having a sweepstakes during January - the winner will receive 3 Lightning-fast Language books of their choice! Lightning-fast Language books are available at Amazon.com (most in both print and kindle formats), and can be ordered through all major book retailers.